6 How to Test it ? 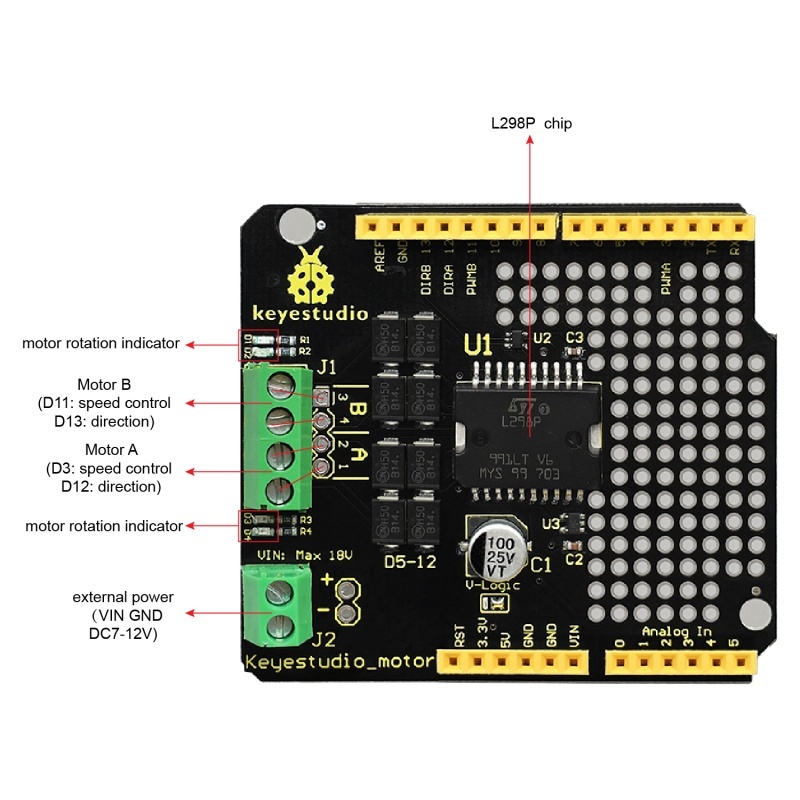 You can use UNO R3 microcontroller and add external components to complete a variety of amazing experiments, such as smart robot DIY. 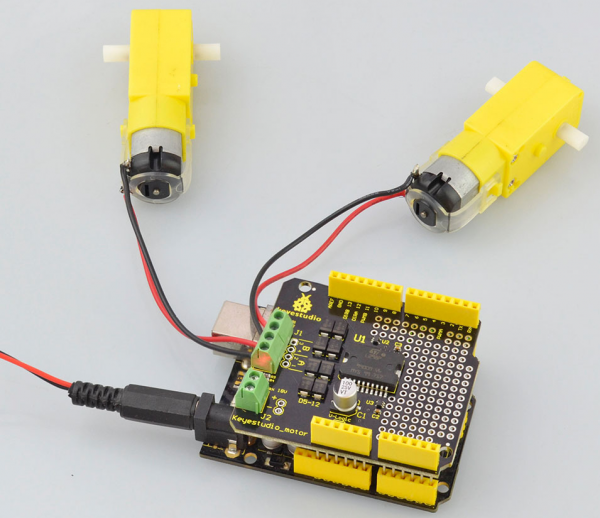 When DIY your robot, it is necessary to use the motor driver board to drive the DC motors, however, sometimes need to connect the motor drive board to UNO using lots of jumper wires, pretty inconvenient. 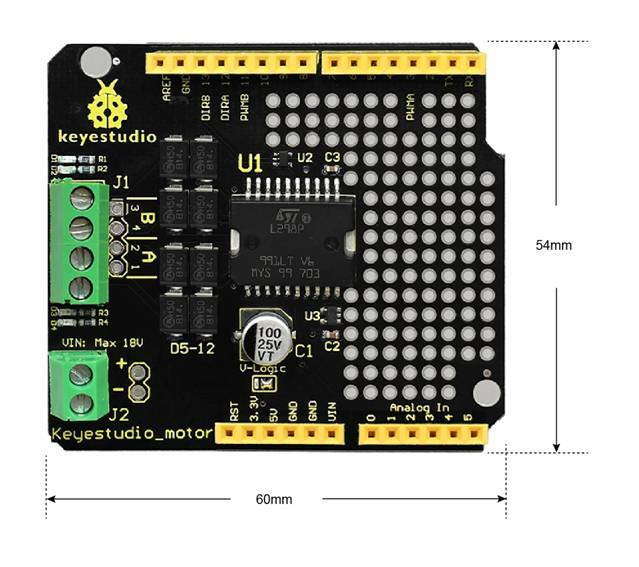 Now, we have launched this keyestudio motor shield with L298P as core. Just simply stack it onto UNO R3 board when using. Note that the motor’s speed and direction interfaces have been connected. D3 is for controlling the speed of motor A, and D12 is for controlling the direction of motor A. D11 is for controlling the speed of motor B, and D13 is for controlling the direction. The green terminal blocks should been connected to VIN /GND pins on the UNO. You can supply the power to the board via the terminal blocks or black DC jack of UNO. The maximum voltage supply is DC 18V. 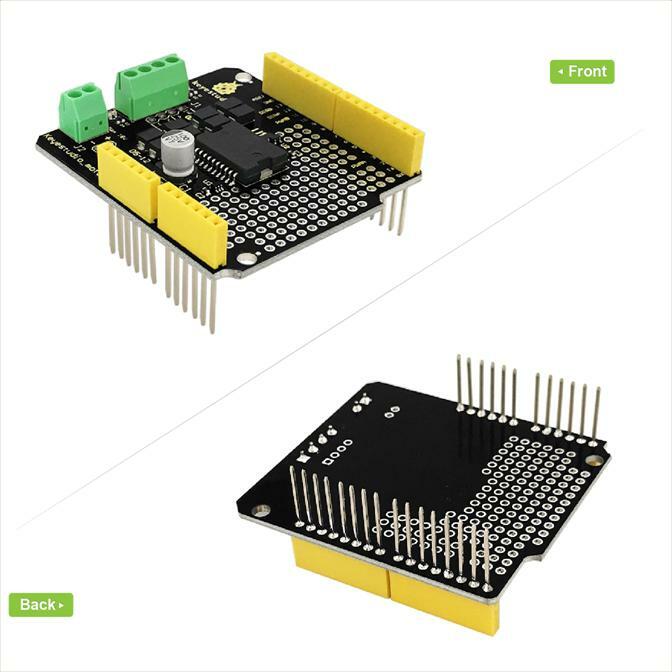 Onboard also comes with through-hole pad, so you are able to weld the electronic elements to design a variety of prototyping circuits. How to Test it ? 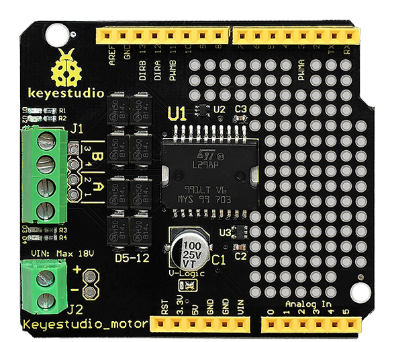 Simply stack the shield onto UNO R3 board, then connect two motors to terminal block. Below is an example code, you can copy and paste it on Arduino IDE. Upload well the code, you should see the two motors firstly turn forward for 8 seconds, then reverse for 8 seconds, repeatedly. This page was last edited on 18 April 2019, at 13:05.